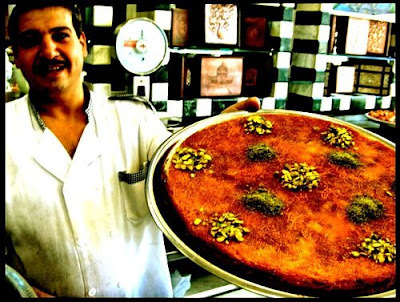 Here I am again with one of my Middle Eastern ingredients – knafeh. 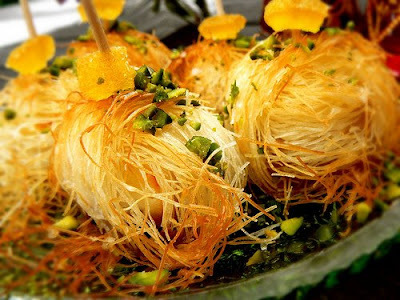 Knafeh is a wonderful ingredient: thin supple white threads that transform into a precious golden crunch in the oven and is one of the main components in various Arabic dessert recipes, along with rose water, pistachios & company. One of my sweet-tooth favourites that I’ve been loving for years is “knafeh bil jibne” which means something like “cheese knafeh” (jibne = cheese). It is a wonderful scrumptious sinful dessert made of cheese (one with a very mild taste like mozzarella or ricotta for instance) stuffed in between a bottom and upper layer of knafeh generously rolled in melted butter and then finished with a blessing of syrup- the infamous syrup that so many Middle Eastern sweets swim in. Generally knafeh bil jibne is prepared in gigantic round pans (as in photos above, which are some old photos from a previous trip to Syria), and if you walk past a Middle Eastern pastry shop it would be exhibited behind vitrines alongside mountains of other sweets- thereby making it literally impossible to just walk past without stepping in first, making a purchase and leaving maybe with a regret for your waistline but cleverly coming up with millions of good excuses that it was worth it, that it was too hard to resist, that you’ll start your diet tomorrow, and that it’s the last time. But the truth is that it’s never the last time because no one can say no to the devil dressed in knafeh. And so this weekend I succumbed and wanted to make them in something other then a huge round pan. I kept all the key ingredients but just played around with the look to create knafeh bil jibnes that are not only delicious, but hopefully also pretty to look at. I’m also submitting this recipe to Food Blogga’s Beautiful Bones event as there’s calcium coming from the cheese in this dessert. I wanted to submit a recipe for this event because I felt Susan's initiative to increase awareness of Osteoporosis was a fantastic idea. My only concern was not missing the deadline (as usually I only have time to cook & photograph on weekends!) but I made it! In regards to knafeh bil jibne, I guess the calcium % beats a brownie or a sorbet for instance… Actually, just for an FYI: 100gr of mozzarella contains 505mg mg of calcium. 100gr of milk contains 120mg of calcium. Not bad eh! Preheat oven to 180C. In a deep pan, place the knafeh that you will be using and cover it with melted butter. Make sure all the knafeh is well rolled into the butter- you almost need to massage it with the butter. 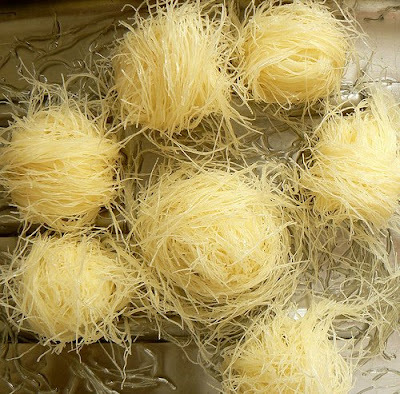 Then, bring your mozzarella balls and roll strands of knafeh around it until it turns out looking like a ball of knitting yarn. Place the knafeh balls in a buttered pan and bake in oven for about 15mins. 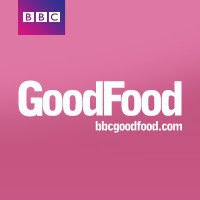 I’d strongly recommend that as of 10mins, check your oven as knafeh can sometimes be unpredictable and burn quite fast! You’ll know it’s ready when it becomes of a beautiful luminous golden colour. While it’s in the oven, prepare the syrup: place equal amounts of sugar and water and boil for a good 10 mins (until it’s texture is rather thick). At the end, add some rose water to the syrup. When the knafeh bil jibne is out of the oven, immediately pour syrup (be very generous here, it needs a lot of syrup) on each ball. Sprinkle with crushed pistachios and decorate with a piece of candied fruit (optional). I have never seen it before but it sure looks good after it is baked! I love the stuff! When visiting my parents in Dubai my fave Lebanese bakery is almost my first stop and with a huge box load of bakalava I make sure I have a good supply of their knafeh! Nice one! Oh wow! How sinfully good is this for you Marianna? Love the knafeh and how you repard it with cheese and rosewater syrup. 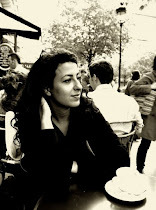 Ahhh Marianna, you've used what we call Kataifi and you prepared it wonderfully. I like the crunch and then the soft center. I ate it once and I loved it. Isn't it also called kadaif? Aran- I hope you bump into this in "real". I think you'll love it bc it's hard to resist! Meeta- hehe I'm the same, I get huge boxes of everything when I'm at Lebanese pastry shops! It's too tempting! Peter M- yap, another of those shared ingredients. I think in Turkish it's also called kataifi too. And you are spot on, that's exactly what I love- the contrast between crunchy and soft. Linda- thanks for your comment. Well the whole name thing gets complex depending on each country. For me technically kadaif would be a kind of pancake dessert stuffed with walnuts and drenched in syrup. It all comes down to what country is calling what dessert what. Bakerette- hehe, we call it "eshta" too. But you are right, I guess most would call it "jibne", although I have seen it going under the name "eshta" outside of Egypt. They are very precise as to whether they are using jibne or eshta hehe! 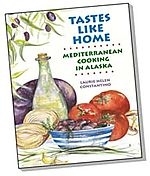 I love learning new food and flavors from you, Marianna! And these are wonderful! 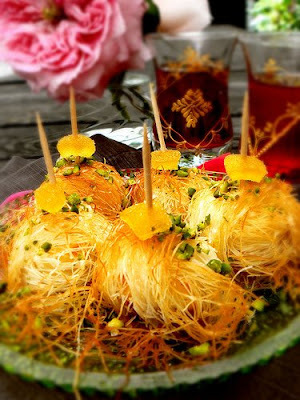 I never tasted it but it looks realy good and beautiful, just like sweet little nests. wow. thanks for sharing on this. it really looks so delicious. i love trying out diff cuisines! I don't know. I have NEVER had any middle-eastern food that I liked. But the post looks interesting. We PROFESSIONAL CHEFS are always looking for something interesting. Thank you for a unique entry. This is a real stand out! kenafeh this is asweet surender. i have to order one today. I have never seen a more decadently beautiful dessert. Perfect in all aspects. You are a genius with desserts, Marianna! I love knafeh, and my local Middle Eastern grocery store only sells it in mass quantities so I've been meaning to make it myself. I've only had it with ricotta, but I'll have to try out mozzarella, because yours look scrumptious. This looks wonderful and, for me, a very unusual use of kataifi (marc: in the US stores I've seen, knafeh is usually sold as kataifi). I'll be very interested to try this - I wonder what kind of cheese is traditionally used for this dish? Thanks for a great recipe! Patricia- thank you! I enjoy learning new things on your blog too! Susan- it was a pleasure to participate into your event! Glad I didnt miss the deadline! Latifa- that is exactly the way to put it "sweet surrender" you are 100% right! Nina- thank you for always being so kind with your comments! I consider you a kitchen genius too! Marc- Thanks for the comment. I am guessing it probably would be available at any Middle Eastern shop. It also goes under the name "kataifi" as Laurie pointed out. I heart Kale- any mild cheese works with this. I prefer using mozzarella because it produces a thicker soft center whereas ricotta is a bit more "airy" to me. Laurie- thanks for your comment. Traditionally and historically speaking the cheese that is used is called "nabulsi cheese". 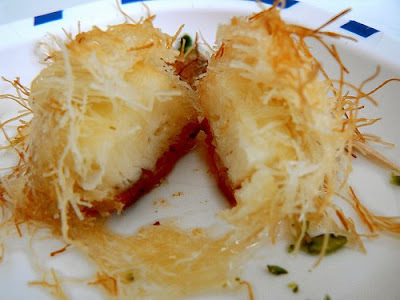 Today, this dessert can be made with cheese (nabulsi, or any other mild cheese which becomes elastic) or "eshta". "Eshta" is like the thick layer that floats on top of milk when you boil it. Both are delicious. This is my favorite Turkish (!) dessert. 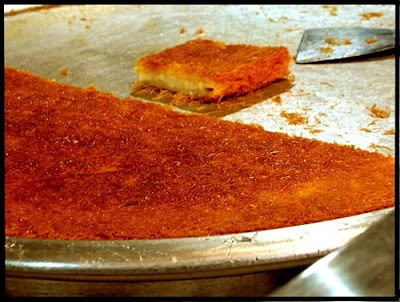 We call it Künefe here. Never attempted to bake it at home though.. Photos look amazing, as always..
Help! I am dying to make kanafe at home but I'm in a small, unpopulated area and it is impossible to find the ingredients. 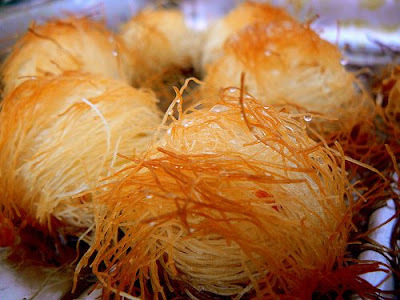 How can I make the vermicelli-like filo pastry myself? Is there a recipe for the sesame bread that you put the kanafe in? 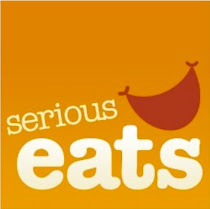 Do you put semolina in the recipe? I appreciate your help, or any suggestions so that I can educate my husband on one of the Lebanese treasures! 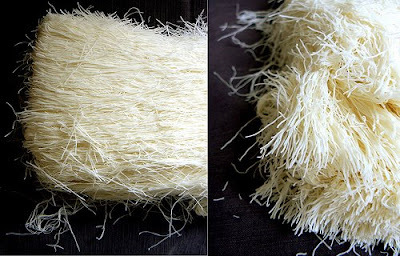 Ive never tried making knafeh before... but there may be a way (would be a very delicate method however) which is to cut phyllo dough into super thin threads to ressemble knafeh... Maybe there's some site that you could buy knafeh off from online..?